From January 1993: the first issue of THE OFFICIAL STAR TREK DEEP SPACE NINE MAGAZINE from Starlog. Boldly building on the success of the long-running (it eventually covered all seven seasons) TNG Mag, this was the logical (ho-hum) companion to Paramount's space station spin-off. That first season was a January launch (giving the production more time to bed in, dodging the hoopla of the traditional September season premiere and minimising the studio's sure-to-be-stellar losses if the whole shebang flopped badly) and this launch issue dropped alongside the feature-length premiere and first one-hour outings. The gold ink cover shows that even Starlog had been suckered into the premium cover craze sweeping the geek print industry. Did you buy a dozen copies? The formula was tried and tested (and a little tired): lengthy episode summaries, interviews with cast and crew and sundry behind-the-scenes features. All presented in a predictably uncritical fashion (and there were a few stinkers, as well as a few standouts, in that first season). The magazine, like its stablemate, was published semi-erratically to match the TV seasons. It eventually clocked up 25 issues, through to 1998, before closing with coverage of the end of the show's sixth season. It didn't return for the seventh, and final, outing. 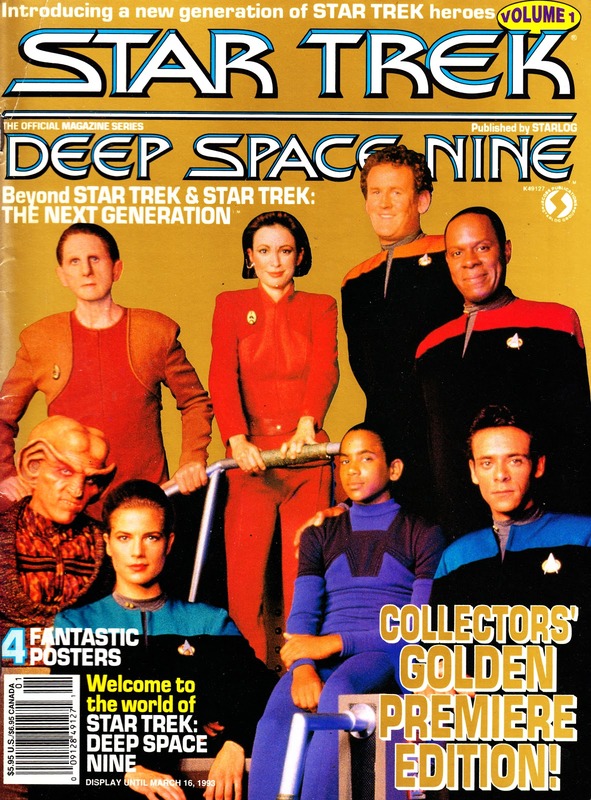 It was joined by STAR TREK VOYAGER MAGAZINE in 1995. That tie-in spanned 19 issues before also closing in 1998. Poor old ENTERPRISE, the last of the TV Treks (at least until 2017) didn't even merit a one-shot and was left to Titan's all-generations mag. Issue 1 of STAR TREK VOYAGER also boasted a shiny ' foil ' cover. Alas for poor ENTERPRISE. it emerged just as the STARLOG group was getting out of the licensed magazine field. If there is to be a new trek show in 2017, it will surely generate enough material for more spin - off magazines and books.